The education sector in Haiti has long been marred by poor literacy rates and low levels of public spending. 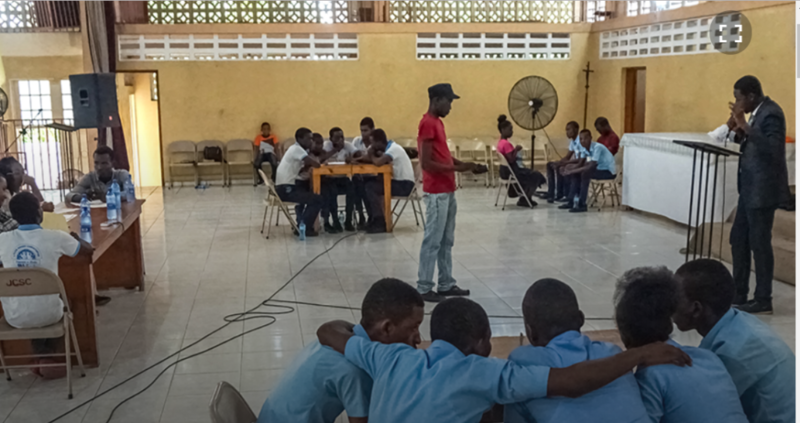 As the government and NGOs strive to raise education levels, a knowledge competition promotes learning through a contest for students in the area including Port-au-Prince, Haiti’s capital. PORT-AU-PRINCE, HAITI – Angela Joseph, 17, beams with excitement as she shuffles in a crowd through the doors of a large school hall south of Port-au-Prince, Haiti’s capital. Once inside, students rush for front-row seats. Joseph, a secondary-school student in her final year and a second-time competitor in Municipal Interschool Genius (Génie Interscolaire Municipale), says her anticipation kept her awake the night before. Municipal Interschool Genius is a competition designed primarily for students from ages 15 to 19 who live in Carrefour, one of 145 administrative areas in Haiti, known as communes. The competition tests their general knowledge. For Joseph, the competition is a learning opportunity and a springboard. Haiti’s education system is building its potential for growth, but the quality of learning is still low, experts say. Portal of Knowledge (Portail du Savoir), a local nonprofit, hosts this annual competition to strengthen student knowledge, complementing the efforts of government and other organizations. Characterized by low literacy rates, a shortage of school infrastructure, and a lack of qualified teachers, Haiti’s education sector has traditionally been overlooked by the government. Government expenditures on education have historically been so low that the country’s spending levels rank among the lowest in the world in relative terms. Prior to 2010, government spending on education was approximately 2 percent of the country’s gross domestic product, according to 2006 data from the Canadian Foundation for the Americas, a think tank. Only 20 percent of education expenditures reach rural Haiti, where 70 percent of the population lives, according to a United States Institute of Peace report. Despite underfunding, the government has developed policies to improve the sector by focusing on both teachers and students. Enrollment rates have increased, with 90 percent of children of primary-school age in school, but poor classroom participation is stalling academic progress. On average, 28 percent of class time is spent with six or more students unengaged in class activities, according to a joint study by the World Bank and the Haitian government. To address this challenge and to boost learning outside of the country’s classrooms, Portal of Knowledge kicked off the Municipal Interschool Genius competition four years ago. The competition is fully funded by the nine-member team of young education professionals who founded the organization. Participants are tested on subjects ranging from chemistry to history, and the winner walks away with a laptop or tablet, in addition to a trophy. Approximately 160 students from 16 schools participated in the competition this month, says Makenson Phanor, the general coordinator of the organization. Students now have an incentive to expand their knowledge and develop critical-thinking skills outside of the classroom, says Wendryghés Jean, vice coordinator of the organization. Last year’s winner, 17-year old Whenchel Chery Jeanty, says his success came from many weeks of preparation with classmates from her school, Louis Joseph Janvier High School (Lycée Louis Joseph Janvier). The competition also exposes young achievers to a variety of academic and professional opportunities that can help them become key players in the country’s development, says Jean Jean Roosevelt, a Haitian singer and 2013 winner of Francophone Games (Jeux de la Francophonie), an arts and sports competition for citizens of French-speaking countries. But as many as 400,000 Haitian children do not have such opportunities, because they are not in school, says Pierre Josué Agénor Cadet, minister of national education. Officials are discussing ways to collaborate with Portal of Knowledge to make the learning experience more accessible to students across the country, says Jude Edouard Pierre, mayor of the Carrefour commune, just 17 kilometers (10 miles) from the capital. Nicole Muteteri, GPJ, translated this article from French to English.